No visual records are available of the Shard of Damnation, but this artists’ rendering of a similarly named hulk, the Sin of Damnation, is representative of a space hulk’s surface. The Shard of Damnation is one of the smallest—and most mysterious—space hulks that cross the Segmentum Ultima. A traditional conglomeration of starship wreckage, rock, and space debris, the Shard is only 5 kilometers in length, yet for reasons that defy traditional science, the hulk has a habitable atmosphere on its surface. The Shard also is noteworthy for its frequent appearances. All space hulks enter and exit the Warp, seemingly at random, but unconfirmed sightings of the Shard number in the hundreds over the past 2,000 years. Although many of these sightings are unsubstantiated, the Imperial Navy has confirmed the space hulk’s appearance in six planetary systems within the past 20 years—all in the Eastern Fringe. A sketch of hieroglyphics carved into several pylons buried in the space hulk’s surface. Only one known expedition to the Shard is documented. 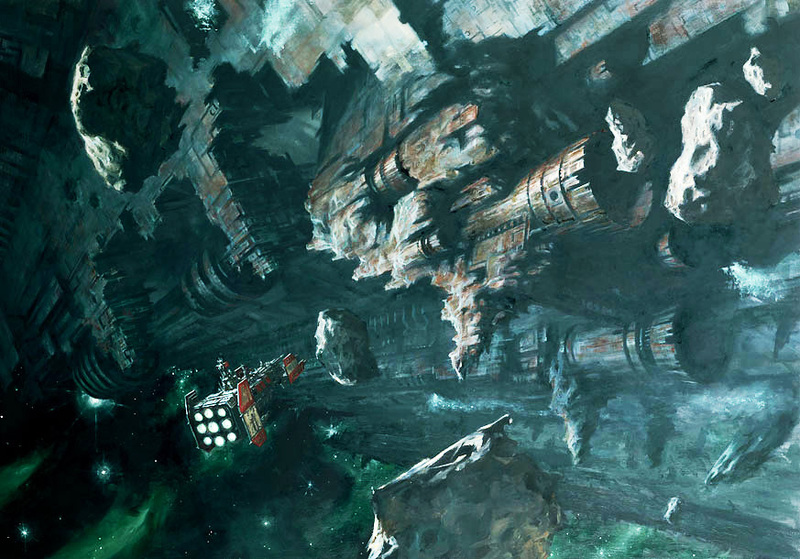 In 728.M41, the Adeptus Mechanicus and Astral Claws attempted to land on the hulk as part of an expedition seeking relics from the Dark Age of Technology. As shuttles approached what appeared to be a millennia-old spacecraft buried in the surface, several unidentifiable pylons scattered across the hulk suddenly began to glow. Moments later, the hulk slipped back into the Warp, its wake pulling two shuttles manned by skatarii into the Immaterium, as well. The shuttles of the Astral Claws, approaching from a different trajectory, escaped destruction. The Imperial Navy, as well as other Imperial authorities, are under orders to report any sightings of the Shard to the Nguyen Naval Base, Belliose System.